Jack Johnson's song sums up the trillion-dollar trend that's driving the stock market higher this year. The title: "We are going to be friends." 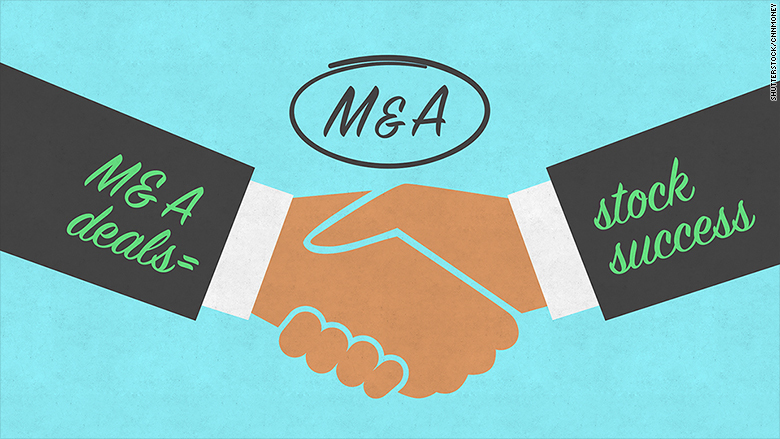 Companies across the globe are shaking hands in a mergers and acquisitions craze. Global M&A value in the first half of this year hit an eight-year high, second only to the all-time record set in 2007, according to new data from Dealogic. America is especially hot. The value of M&A deals involving U.S. companies so far this year has already surpassed $1 trillion. It's the first time in history that has happened before the end of June, Dealogic notes. Investors love M&A because combining two companies generally expands market share and helps cut down on costs. Related: Will health mergers increase your premiums? The surge is here to stay: Experts say the mega-deals will keep coming, especially in health care. "It'll definitely be true for the rest of this year, and I wouldn't be surprised to see it carry over into 2016," says Peter Tuz, president of Chase Investment Counsel in Charlottesville, Va. It's a great climate for M&A deals. Companies are flush with cash, and they can also borrow money easily at very low interest rates. On top of that, sales growth has been weak, prompting businesses to be creative about how they engineer growth. M&A deals also tend to make it easier for businesses to negotiate better terms with suppliers. "You're gaining more bargaining power," says Tuz. Newly merged companies can say to suppliers,"We're paying X for your services. We now want X minus 5%." The big driver in America: Health care M&A deals tower over all other industries. The endless search for the next big cure or drug and the possibility of expanding market share is pushing companies together. Health care mergers are at a record -- topping $342 billion so far this year. While there is concern that some small health and bio-tech companies are overvalued, experts aren't calling the health care M&A craze a bubble (yet). More deals are likely to come soon. Health insurance companies Aetna (AET) and Humana (HUM) are inches away from a merger, according to reports, and Anthem (ANTX) is also in arm-wrestling talks with Cigna (CI). The pay-off for investors are usually large. When rumors about the Aetna-Humana deal first circulated, Humana's stock jumped 20% in one day. Cigna may not be pleased yet with Anthem's offer, but its stock continues to go up and up on merger rumors. All smiles at Goldman Sachs: Health care isn't the only big winner. Goldman Sachs CEO Lloyd Blankfein loves M&A too. Goldman (GS) pulled in a handsome $1.2 billion as an adviser on M&A deals so far this year, Dealogic data shows. That's $370 million more than the next guy -- JP Morgan (JPM). No wonder Goldman's stock is up 13% over the past three months as M&A buzz has heated up. Related: The next bubble: bonds, startups, China? Bubble fears: It might raise eyebrows that M&A activity is reaching values last seen right before the financial crisis. "This time is different" are dangerous words in the stock market, but there are some clear differences in 2015. Between 2006 and 2007, financial sector M&A deals made up over half of all deals. Now financial companies make up less than a third of deal activity, according to Jeffrey Kleintop, chief global investment strategist at Schwab. Consider that telecommunications, energy and consumer companies make up 45% of the deals this year. That broad balance of deals bodes well for the stock market, Kleintop argues. If anything, the uptick in M&A deals shows companies are dipping into their piggy banks to invest in other companies, which could generate better profits long term. Businesses are also sitting on a lot of cash now. Paying in cash is a healthy sign because during past M&A peaks, companies sometimes paid with overvalued stocks. "Instead of indicating new risk in the markets, the resurgence in M&A activity may be positive for investors," Kleintop wrote in a recent note.